If you have an EMERGENCY and need an ambulance, DIAL 9-1-1. We respond on emergency calls ONLY as a “back-up” for the local Emergency Medical Services (EMS) agencies in Guilford County, Davidson County, and Randolph County. You SHOULD NOT call our non-emergency office telephone number when you experience an EMERGENCY situation! Our office staff is neither trained or equipped to provide EMERGENCY dispatching services. When you DIAL 9-1-1 for an EMERGENCY, the trained Emergency Medical Dispatcher (EMD) who answers your 9-1-1 call can often times provide life-saving assistance to you over the telephone while an ambulance is being dispatched. If our assistance is required, the EMD will dispatch a PTAR ambulance via radio. 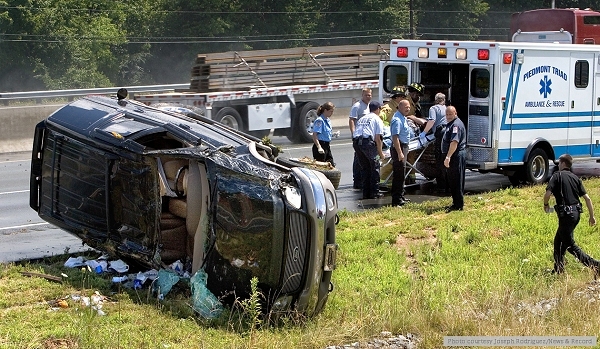 In come cases, 2 ambulances may be dispatched — 1 County EMS unit, and 1 PTAR unit. This is done whenever a PTAR unit is closer to an emergency call. Upon arrival on the scene, and depending upon the condition of the patient(s), PTAR might also transport the patient(s) to a hospital. That helps to keep County EMS units in service, and available to answer higher priority emergency calls. Your local Fire Department might also be dispatched on emergency medical calls. The reason for that is simple — there are many Fire Stations based throughout the Cities and Counties that we serve, but only a few EMS Stations. Therefore, a nearby fire truck can often reach a patient in distress MUCH FASTER than an ambulance which might have a much longer distance to travel. The Firefighters at both City Fire Departments and County Volunteer Fire Departments are trained as EMTs, and they carry Basic Life Support (BLS) equipment and supplies on their fire trucks or squad trucks. In a life-threatening emergency, the Firefighters can arrive quickly, and administer first-aid while awaiting the arrival of an ambulance. They can also provide valuable and time-saving assistance to the EMTs or Paramedics. The Firefighters frequently perform useful and helpful tasks, allowing the EMTs or Paramedics to devote their entire attention to the patient. Examples include obtaining equipment and supplies from the ambulance, as the Firefighters are familiar with such items and know where they are stored within the ambulance. They also perform other functions, such as opening doors, moving furniture so a stretcher can be brought into the patient’s house, helping lift and place the patient onto a stretcher, etc. Once the patient has been prepared for transport to a hospital, the Firefighters can return equipment and supplies to the ambulance and store it in its proper place while the EMTs or Paramedics continue to tend to the patient. Firefighters often assist the EMTs or Paramedics with much more important tasks, as well, such as helping to perform CPR. Other assistance they can provide is taking charge of small children who would otherwise have to be left alone when a parent or guardian must be transported to a hospital. They also sometimes ride to the hospital in the ambulance, again assisting the EMTs or Paramedics as they administer care to a patient. 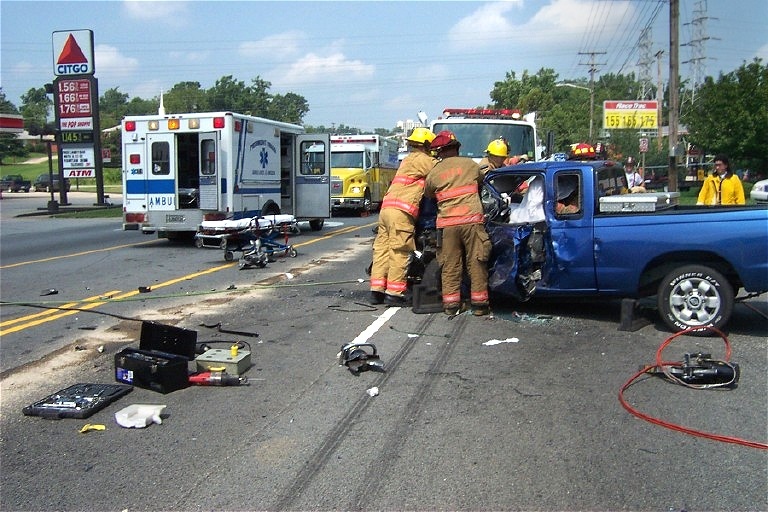 In the case of an automobile accident, Firefighters carry and are trained to use specialized rescue equipment, such as the Jaws of Life tool which is used to extricate patients from mangled automobiles. They often cut the battery cables on cars, to disable the electrical system and to prevent the engine from restarting by accident. And if there is a fuel spill or anti-freeze spill from a wrecked car, the Firefighters spread absorbent material onto the roadway to absorb hazardous liquids, and to help prevent more accidents from occuring due to a slick road. They also help direct traffic around accident scenes until a Law Enforcement Officer arrives. And, of course, they are readily available should a wrecked automobile catch on fire. Don’t be alarmed if you call 9-1-1 for a medical emergency and the Fire Department responds. The Firefighters are there to help you, and to assist the EMTs and Paramedics so they can devote their entire attention to the patient. So, if you ever experience an emergency medical situation, just DIAL 9-1-1 and your call will be dispatched to the most appropriate provider(s). Only call our office telephone number when you would like to schedule one of our other services, or if you need to discuss your billing or insurance information, or if you need to conduct some other routine business of a non-emergency nature.